Dr. Justin Walbom DC Chiropractor has been a chiropractor for +10 years after graduating from Parker College of Chiropractic. He brings that wonderful patient knowhow experience to each patient. Dr. Justin, as he likes to be called was trained by Dr. Millar before taking over Dr Millar's Madison chiropractic patients. 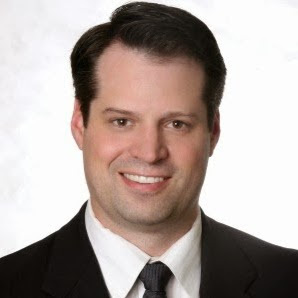 In addition to being the Senior Millar Chiropractor at the Madison chiropractic clinic, Dr. Justin is the Madison AL city partner and Sr VP and Chief Clinic Director of all Millar Chiropractic Clinics. Dr. Justin uses many techniques such as Atlas-Orthogonal, Gonstead, Thompson, Diversified and Activator Instrument adjusting. The patients rave about his adjusting skills and quality care. They like his get to the "root cause" and fix it determination. Dr Justin likes to say, "If your a hammer then everything is a nail; but, if you have many adjusting tools in your tool box, you choose the one that fits the patient's needs." Dr Millar went on to say, "Dr Justin seems to have that 6th sense on just how to treat each patient to produce the best results possible and help them with their condition. That can't be taught. It has to be learned over time." The Madison patients rave about his spine treatment, his adjustments, and thoroughness, and bedside manor. You will too. Under Dr. Justin's guidance, Millar Chiropractic - Madison AL has received the Best of Madison, Chiropractor award for the past 2 years. Of course Dr. Justin helped Millar Chiropractic Clinics win the coveted #1 Best in Business, Chiropractor for Huntsville and the Tennessee Valley 2011-2015. Dr. Justin is now accepting new patients. Dr. Justin is a Medicare and BCBS of AL provider. He also accepts cash patients. Dr. Justin practices at the Millar Chiropractic - Madison AL clinic Monday through Friday 8am till 1pm and 3pm till 6pm by appointment. The clinic closes early at 1pm on Thursdays. D. Justin is a devoted family man of 18 years. He is married to attorney Liz Walbom, JD. Together they have 3 beautiful and wonderfully talented children. Dr. Justin actively participates in his church and in the community. He is the current president of the Alabama chapter of a non-profit organization called "We Witness Music." Dr Justin enjoys golfing and fishing with his sons. Dr. Greg Millar, DC CCEP Chiropractor. has been a Chiropractor since 1997 when he graduated from Life University College of Chiropractic in Atlanta. Before going to chiropractic college Dr Millar was an electrical engineer. He has completed additional study and is certified as a Certified Chiropractic Extremity Practitioner. He is Board Certified have completed National Board of Chiropractic Examiners Parts I-IV and Physiotherapy. 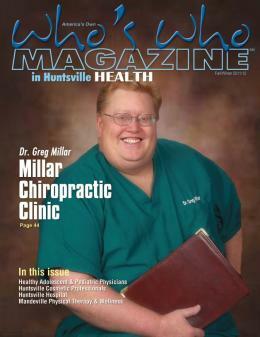 He is the founder and CEO of Millar Chiropractic Clinics. He worked with UAB Dept of Neurosurgery developing the UAB Chiropractic Care Team. As a Chiropractor Madison AL he opened the Millar Chiropractic - Madison AL clinic in 2002 and practiced daily at the spine care clinic till 2014. Perhaps he is best known for his work on Channel 31 Waay TV with the BackTalk and MedLine TV shows. He now is part time and sees patients by appointment only at the Madison clinic.